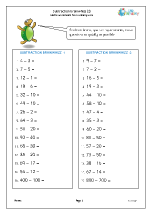 Bar models and number lines are a great way to help children understand subtraction and are being used in more and more schools. 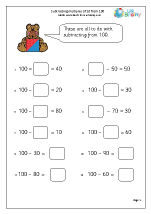 Plenty of practice at subtracting mentally, including subtracting single digits from 2-digit numbers, subtracting multiples of 10 and completing number sentences. 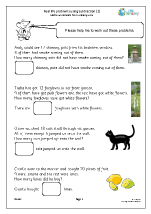 Word problems needing simple subtraction with numbers up to 20. 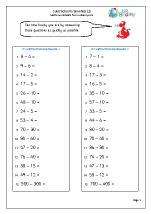 Once they are really confident with mental subtraction children can be introduced to simple written subtraction using columns. 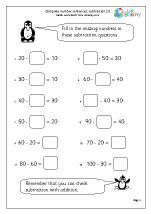 Further activities including recognising the relationship between addition and subtraction which can be used to check answers. 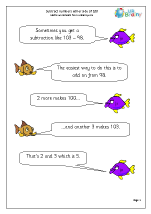 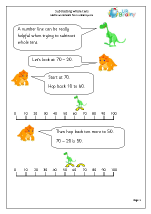 Subtraction really takes off in Year 2 as the knowledge and skills gained in Year 1 are extended to larger numbers. 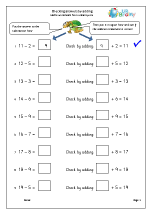 • recognise and use the inverse relationship between addition and subtraction and use this to check calculations and missing number problems. 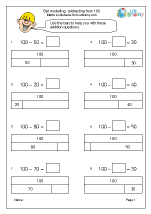 It is also suggested that children should begin to use columns to record their subtraction calculations, in readiness for the formal written method next year. 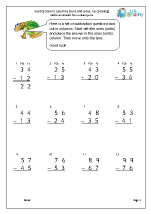 take away, subtract, how much less is, difference between as well as reading and writing the minus (-) sign. 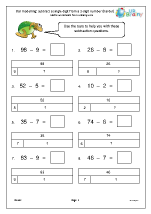 As with addition the emphasis is put on mental arithmetic so that by the end of the year children are responding quickly and accurately to oral and written questions. 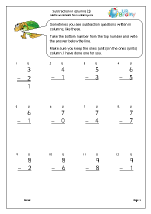 The key this year is to really learn basic number facts off by heart and then use them to work out other facts. quickly 90 - 50. 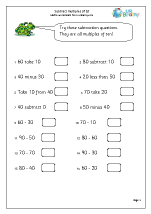 This relates to knowledge of place value in number work. 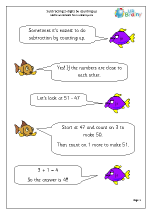 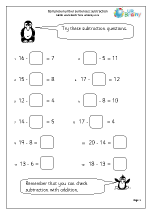 d. using inverse operations to check answers e.g. to check 10 – 7 = 3 by adding 7 and 3 to make 10. 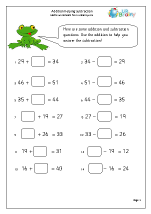 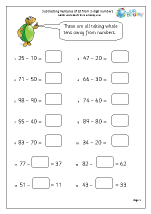 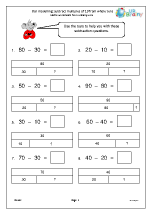 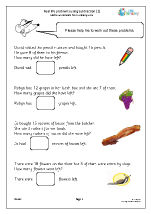 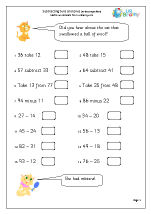 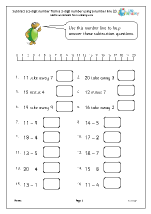 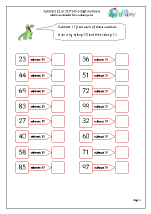 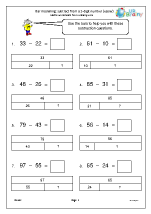 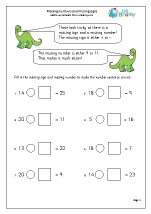 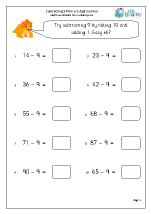 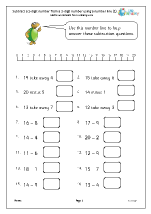 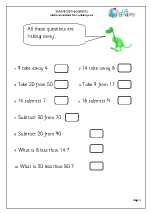 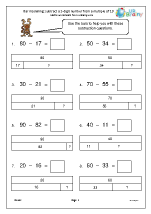 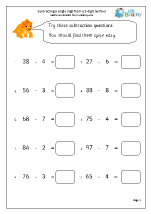 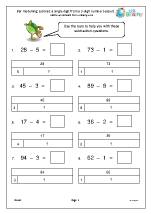 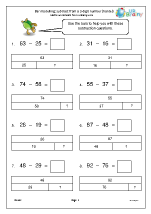 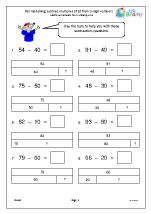 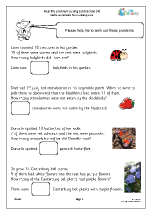 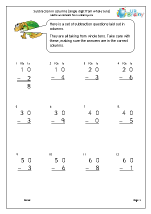 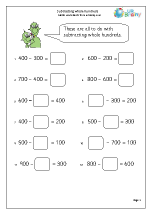 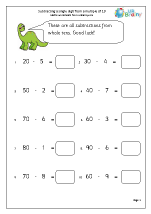 With well over 100 colourful pages of subtraction worksheets there is plenty to choose from and don’t forget to have a go at our Year 2 Subtraction Games, but you will need the Flash Player for these.